Bendroflumethiazide is a diuretic used to treat high blood pressure. Our fast and safe online doctor service takes the hassle out of obtaining your repeat prescriptions. To place your order, fill in our short medical questionnaire. 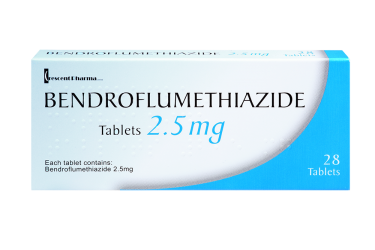 One of our UK based doctors will review your answers and confirm whether it is safe for you to continue your treatment with Bendroflumethiazide tablets. Please note that our service is only suitable for patients who have been taking Bendroflumethiazide for at least three months and whose blood pressure is well controlled. Bendroflumethiazide is a thiazide diuretic for high blood pressure. This type of medication is also referred to as water tablets, as it reduces the amount of fluid your body retains. By making you pass more urine, water tablets remove fluid from your body, which lowers your blood pressure levels and makes it less strenuous for your heart to pump your blood through your body. When used to treat hypertension, Bendroflumethiazide tablets are often combined with other medications, such as beta blockers. How Are Bendroflumethiazide Tablets Taken? When you are first prescribed Bendroflumethiazide, your GP will explain how often you have to take your tablets. It is important that you follow your doctor’s advice carefully and that you attend regular check-ups to monitor your blood pressure. Usually, Bendroflumethiazide is taken in the morning, to avoid frequent urination at night. Swallow your tablets whole with a drink of water. Your doctor will decide which dosage is best for you. The usual Bendroflumethiazide dosage for the treatment of blood pressure is 2.5mg per day. Which exact dosage you require depends on your blood pressure, how you respond to the treatment and which other medications you are taking. Combination medications such as Prestim contain Bendroflumethiazide as well as a beta blocker, reducing the amount of tablets you need to take in a day. Elderly patients and patients with impaired kidney function may be prescribed a lower dosage. Please note, product packaging may differ from the image above. During long term treatment with Bendroflumethiazide, your doctor may carry out blood or urine tests to monitor your blood levels of certain chemicals as well as your kidney function. Will Bendroflumethiazide affect my ability to drive and use machinery? Some patients experience spells of dizziness while taking Bendroflumethiazide tablets. Make sure this does not apply to you before driving a car or working with machinery, especially if you have just begun your treatment. If the side effect of dizziness persists, speak to your doctor who may need to adjust your medication. Who can not take Bendroflumethiazide? Bendroflumethiazide is not to be taken during pregnancy or while breastfeeding. Bendroflumethiazide causes side effects in some patients. Bendroflumethiazide can cause changes to your blood, which may show in blood tests. For a complete list of Bendroflumethiazide Side Effects, read the patient leaflet supplied with your medication. Can Bendroflumethiazide React With My Other Medications? Bendroflumethiazide can interact with other medication. Tell your doctor about any remedies, prescription and non-prescription medication you are taking (or have currently taken) before you begin your treatment with Bendroflumethiazide.